As part of our 40th Anniversary celebrations, we are holding a fabulous Gala Ball in the Guildhall on 30th September 2016. This ball is to raise funds for our new Children & Young Person’s Unit. This glamorous evening will start with a champagne reception on arrival, followed by a scrumptious 3 course dinner provided by The City Hotel, Derry. After dinner, to entertain all the guests (including some VIPs…) we have the amazing Dave Martin & the Casino Cats to get everyone down on the dance floor until the wee small hours. There will also be a raffle on the night, prizes for which have been generously donated by local businesses, organisations and individuals. Tickets for this fabulous event are now on sale and will cost £60 per person and can be bought individually or can be bought as tables of 10. These can be purchased from either the City Hotel reception, our Pathways office at 24 Pump Street, or online via paypal on our website, just click on the orange tab on our home page. For further information, please contact Louisa on 028 71416800. We hope to see as many of you there as the Guildhall can hold, all dressed up and ready for a fantastic night of food, music and craic. 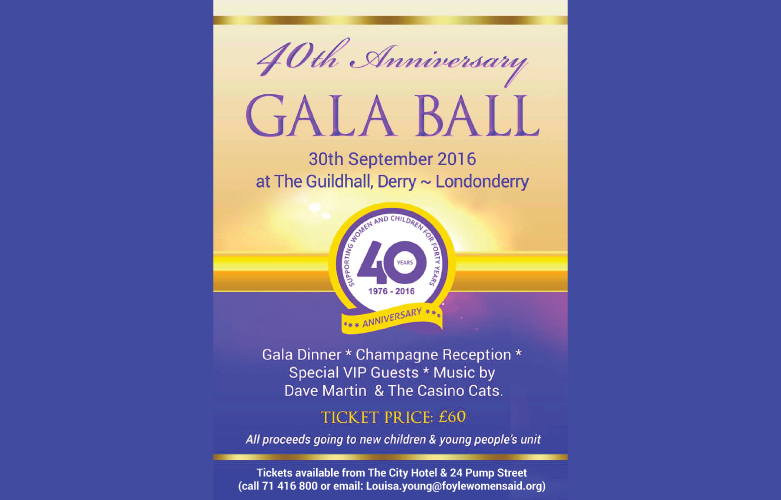 0 responses on "40th Anniversary Gala Ball @ Guildhall Derry~Londonderry, 30th September 2016"